Devising the perfect nerd costume can be achieved in a snap with just a few “nerdy” accessories. This costume is one that does not require many pre-purchased items nor does it take a lot of preparation to construct. With a quick trip to the local super store and a peek in the closet, the perfect costume can be ready for a costume party. The more accessories and the more creative items that are selected for the ensemble, the more original and funny the costume. 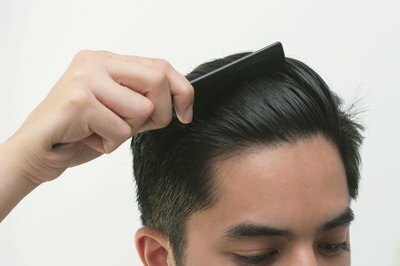 Apply hair gel with comb in a backwards motion. For females with long hair, use comb to part hair in the center and apply hair gel to split ponytails that are aligned just above the ears and secure with elastic bands. 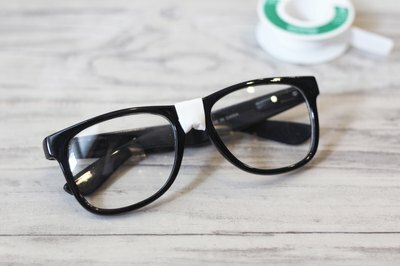 Wrap white Teflon tape around the center of black glasses. Tear off approximately four inches of Teflon tape and wrap around the center of glasses until a thick bulge of tape is dominant. Get dressed. Fasten all buttons of the white shirt to the top and insert stick pens to the left pocket. 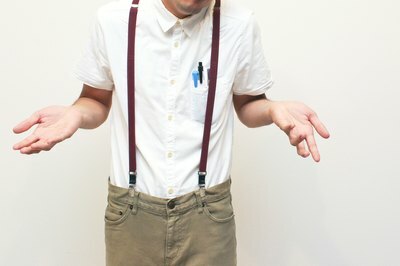 Put on pants, and attach suspenders, adjusting them, so the pants sit above the navel. 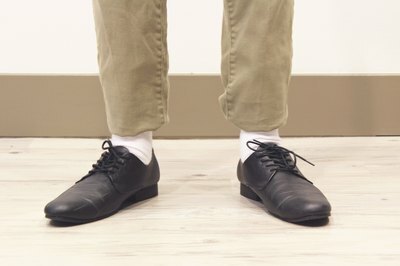 Fold pants under approximately 3 inches above the ankles. It may be necessary to secure the fold with safety pins. Finish with shoes and socks. 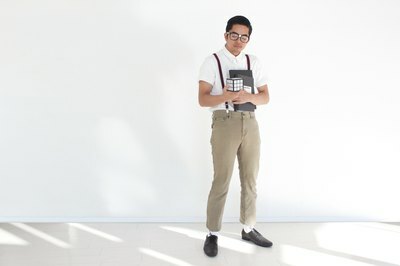 Pull white socks up to the calf, and slip on black loafer-style shoes to complete the nerd costume. Get into character. To complete the look add shrinking posture and nervous chuckles to live the believable nerd lifestyle. When approached, ask seemingly intelligent questions with a math or science theme (for example, "Did you know the circumference of the Earth equal to the distance of a light meter?") and continue to babble when a topic is discussed. If you want to create a more stylish nerd, this look is becoming ever popular in trendy jewelry and shoe stores. Substituting the standard black glasses with those that have printed or neon frames or those that have the lens removed can still showcase a geek costume.